Aim: (1) To evaluate the active chlorine concentrations of 3% sodium hypochlorite (NaOCl), 5% chlorine dioxide (ClO2) and 13.8% ClO2using iodometric titration. (2) To evaluate the effects of different concentrations of ClO2 (5% and 13.8%) with or without 17% ethylene diamine tetraacetic acid (EDTA), on the surface roughness of radicular dentin using three-dimensional-confocal laser scanning microscopy (CLSM). Materials and Methods: Fifty extracted human permanent single rooted mandibular premolars were decoronated, longitudinal split into halves and randomly divided into five groups based on the different irrigation regime: Group 1: 3% NaOCl + 17% EDTA, Group 2: 5% ClO2 +17% EDTA, Group 3: 5% ClO2,Group 4: 13.8% ClO2,and Group 5: Saline. The specimens were observed under CLSM to measure the surface roughness. Iodometric titration of the test irrigants were done to evaluate the concentration of active chlorine. Data were statistically analyzed using one-way analysis of variance and Bonferroni test. Results: Mean surface roughness values to root canal dentin were as follows: 13.8% ClO2 >3% NaOCl + 17% EDTA >5% ClO2 + 17% EDTA >5% ClO2> Saline. The active chlorine concentration was highest for 13.8% ClO2and chlorine loss % was highest for 5% ClO2. Conclusion: According to the present study, 5% ClO2produced root canal dentin roughness with minimal erosiveness, which is advantageous. Hence, it can be considered to be an alternate endodontic irrigant. Nearly 13.8% ClO2should be reevaluated as an irrigating solution, because of its significiant dentin roughness and thus it can promote microleakage. The success of root canal therapy depends on the quality of instrumentation, disinfection, and three-dimensional (3D) obturation of the root canal system. Mechanical instrumentation of the root canal system leaves 35%–53% of areas unaffected that may harbor pulpal remnants, biofilm and their by-products. Irrigation plays an important role in disinfecting and removal of smear layer from the dentin walls than achieved solely by mechanical instrumentation. Sodium hypochlorite (NaOCl) has been widely used as an endodontic irrigant due to its pronounced antimicrobial effects and the capacity for organic tissue dissolution. However, due to its limited effects on inorganic component of the smear layer, ethylene diamine tetraacetic acid (EDTA) is used which acts on the inorganic part of smear layer. NaOCl and EDTA combination increase wettability and surface energy. However, higher concentrations and longer contact times with NaOCl may produce irreversible collagen degradation and dentin erosion resulting in shallower penetration of the sealers into the dentin walls. Therefore, irrigating solutions should only expose the dentin collagen and interfering minimally with the structure. Furthermore, irrigating solutions can cause changes in the microstructure of the dentin and Ca: P ratio, which affects the micro hardness, surface roughness, permeability, and solubility of the root canal dentin, which in turn inhibits the resistance of root canal dentin to bacterial ingress thus permitting coronal leakage. Chlorine dioxide (ClO2) is a new irrigant with proven antimicrobial effect and is biocompatible to the tissues. Its powerful oxidizing property kills bacteria by disrupting the transport of nutrients across the cell wall. It was reported that ClO2 and NaOCl were both effective in eliminating Enterococcus faecalis from the dentinal disks within 30 min. Cobankara et al. demonstrated that 13.8% ClO2 was as effective as 5.25% NaOCl in dissolving bovine pulp tissue. In Captain Sandeep Singh's study, 5% ClO2 showed both tissue dissolution and smear layer removal properties., ClO2 is less cytotoxic when extruded beyond the root apex and it is volatile and quickly evaporates without any remnants. Hence, the aim of this study was to evaluate the active chlorine concentrations using iodometric titration and the effects of different concentrations of ClO2(5% and 13.8%) with or without 17% EDTA, on the surface roughness of radicular dentin using 3D-confocal laser scanning microscopy (3D-CLSM). Fifty freshly extracted human permanent single rooted mandibular premolars with fully formed roots were collected from the Department of Oral and Maxillofacial Surgery, Dayananda Sagar College of Dental Sciences, Bengaluru. Teeth were thoroughly washed and stored in 0.1% thymol for decontamination and were transversally sectioned near the cement enamel junction, with a water cooled diamond disc at low speed. Longitudinal grooves were made on the buccal and lingual surfaces on each root using a diamond disk at low speed without penetrating the canal. The roots were then split into halves with a chisel. For each root, the half containing the most visible part of the apex and total canal length was selected for better visualization of the irrigating solutions' effect on the root canal walls. The commercial preparation of ClO2(BioClenz, Frontier Pharmaceuticals, Melville, New York, USA) is available as two solutions-solution A and solution B. To prepare 10 mL of 13.8% aqueous solution of ClO2, 5 mL of solution A and solution B were freshly mixed as per the manufacturer's instruction before every use. Nearly 13.8% aqueous stock solution of ClO2 was diluted to the desired concentration by adding distilled water using the formula C1V1= C2V2, where C1= concentration of stock solution, V1= volume of stock solution, C2= concentration of required solution, V2= final volume of solution of desired concentration. Therefore, 3.62 mL of 13.8% ClO2 was mixed with 6.38 mL of distilled water to prepare 10 mL of 5% ClO2 solution. The pH of ClO2 was 4.67, as measured by a pH meter (ELICO, pH meter Ll 120). In all the groups, irrigation was performed with 1 mL of each solution, aspirated and refreshed every 5 min repeatedly for a total of 35 min of contact of the solution with the root canal walls. For Groups 1 and 2, irrigation was performed as described for the other groups, followed by irrigation with 1 mL of 17% EDTA for 5 min. At the end of the experiment, all specimens were irrigated with 20 mL of distilled water and dried with absorbent paper points. Three study groups containing 3% NaOCl, 5% ClO2, and 13.8% ClO2 solutions were evaluated for changes in the concentration of active chlorine. Each procedure was repeated three times for each sample. A volume of 5 mL of 4% solution of potassium iodide was transferred to a 125 mL Erlenmeyer flask. Then, 1 mL was added to the sample, followed by 4 mL of glacial acetic acid 2.5 mol/L and the volume completed with water to 50 mL with a beaker. The released iodine was titrated with sodium thiosulfate solution 0.1 mol/L until the medium became light yellow. Then, the titration was stopped by adding 10 drops of starch solution, after which it resumed until the solution became colorless [Figure 1]. The equivalent volume was recorded and the percentages of active chlorine in the solutions were calculated. The specimens were stored in deionized water at 4°C until the analysis of surface roughness, which was performed by an OLS4000 LEXT (Olympus Corporation, Tokyo, Japan) CLSM. The specimens were fixed on glass slides, keeping the surface of the root canal parallel to the slide surface, hence perpendicular to the microscope objective. An image was obtained from the center of the root canal with a ×20 objective, which provided final magnification of 200 times the original size of the sample. The microscope had a 405 nm semiconductor laser that allowed for the 3D reading of the surface roughness (Ra, μm). For each specimen, a central area of the root middle third was selected, and measurement of surface roughness was obtained (Sa conforms to ISO25178) from a delimited area of 640 μm × 640 μm. Representative images of each group were selected for qualitative topography analysis [Figure 2]a,[Figure 2]b,[Figure 2]c,[Figure 2]d,[Figure 2]e.
Statistical analysis was performed by SPSS (Statistical Package for Social Sciences) software version 17 using one-way analysis of variance (ANOVA). To find out significant difference between the groups, we carried out multiple comparisons using Bonferroni test. The significance level was set at P < 0.05. The frequency distribution for the study variable was expressed in terms of mean and standard deviation. One-way ANOVA test followed by Bonferroni's post hoc analysis was used to make multiple comparisons between 5 study group. The level of significance (P value) was set at P < 0.05. An ANOVA test was done to compare the mean surface roughness between 5 study groups followed by Bonferroni's post hoc analysis. The test results revealed that Group 1 showed a mean surface roughness of 7.90 ± 0.41, Group 2 showing with 7.72 ± 1.46, Group 3 with 6.02 ± 1.21, Group 4 with 12.15 ± 1.77 and Group 5 showing with 4.57 ± 0.47. There was a statistically significant difference in the mean surface roughness scores between the 5 study groups at P < 0.001 [Table 1]. Multiple comparison using Bonferroni's post hoc Analysis revealed that Group 4 showed statistically significant increase in mean surface roughness compared to all the other study groups at P < 0.001, followed by Group 1 and 2 showing a significant increase in surface roughness compared to Group 3 at P = 0.03. A significantly least mean surface roughness was observed in Group 5 as compared to other study groups at P < 0.001. 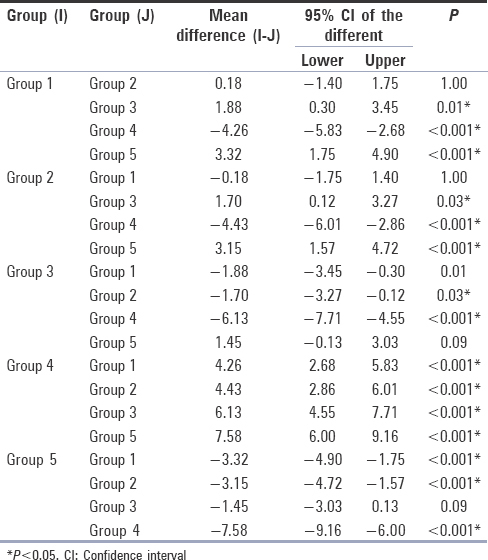 However, though Group 5 had least mean surface roughness, there was no statistically significant difference observed between Group 3 and 5, P = 0.09 [Table 2]. Hence, we can infer that the Group 4 was having significantly higher mean surface roughness followed by Group 1 > 2 > 3. Group 5 was having significantly least mean surface roughness compared to all the other study groups. Iodometric titration was used to determine the concentrations of chlorine available in the solutions. The values of the concentrations of active chlorine (mass/volume m/v) contained in the evaluated irrigating substances are exhibited [Table 3]. Irrigating solutions are used in endodontics to complement the mechanical action of endodontic instruments for the cleaning and disinfection of root canals. The most commonly used NaOCl and EDTA combination provides a predictable means for the removal of smear layer as part of their root canal cleaning objectives. This combination causes physical and chemical changes in the ultrastructure of the root dentin, by dissolution of intertubular and peritubular dentine and widening of dentinal tubules thus, increasing dentin permeability and decreasing micro hardness. There is a direct correlation between the intensity and concentrations of the irrigation used and the alterations in the dentin substrate. ClO2 can be a possible root canal irrigant, due to its antimicrobial action and its ability to dissolve both organic and inorganic tissue. Previous studies have used commercial available concentration of 13.8% ClO2.,, Since, ClO2 is unstable above the concentration of 9.5% ([ClO2] [air]) and is pungent at higher concentrations, an experimental concentration of 5% ClO2 was used in the previous study which showed tissue dissolution and smear layer removal properties., A study by Ballal et al. using 13.8% ClO2 showed reduction in microhardness of root canal dentin similar to 2.5% NaOCl and more reduction in microhardness values when compared with 17% EDTA. Hence in this study, both 13.8% of ClO2 and 5% ClO2 concentrations (BioClenz; Frontier Pharmaceutical, Melville, New York, USA) were tested. Dentin surface treatment with different irrigation regimens may cause alteration in the chemical and structural composition of human dentin, thereby changing its permeability and solubility characteristics and hence affecting the adhesion of materials to dentin surfaces. Surface roughness can be measured by various methods such as atomic force microscopy, profilometry, or CLSM. In this study CLSM was used for surface roughness analysis. The CLSM is an optical microscope that includes a laser light as a light source and an electronic system which helps on image processing. The several advantages of CLSM are higher resolution, greater contrast and three dimensions reconstruction; can collect serial optical sections even from thick specimens, digitalize the image and use imaging techniques for quantitative morphometric measurements. CLSM does not require any special specimen processing, and hence, it tends to produce fewer artefacts. CLSM is a nondestructive approach as it allows the reuse of the same specimen in another evaluation and the observations can be made under normal environmental conditions. Hence, it is a suitable experimental aid to determine the surface roughness in root canal lumen. 13.8% ClO2>3% NaOCl + 17% EDTA >5% ClO2+ 17% EDTA >5% ClO2> Saline. According to Zhang et al., the superficial destructive effect on mineralized dentin with 5.25% NaOCl is irreversible, irrespective of whether EDTA is subsequently employed. Hence, here 3% NaOCl was used along with EDTA. Though Group 1 (3% NaOCl + 17% EDTA) showed increase in mean surface roughness compared to Group 2 (5% ClO2 +17% EDTA), there was no statistically significant difference observed. EDTA enhances the removal of the smear layer in the root canal, thereby increasing the chemical interaction of irrigating solutions with the dentinal walls. NaOCl reacts mainly with the organic matrix of dentin, increasing its permeability to the chelating agent EDTA, which in turn operates in the inorganic matrix, resulting in increased surface roughness. Five percent ClO2 has both organic and inorganic tissue dissolution., Thus, its usage along with EDTA would have enhanced the removal of smear layer and increase the chemical interaction of irrigating solutions with the dentinal walls thus, increasing the surface roughness almost in par with Group 1. Though Group 3 (5% ClO2) had mean surface roughness values more than Group 5 (saline), there was no statistically significant between them. Thus, the irrigation protocols without 17% EDTA presented lower roughness and dentin surface topography similar to saline. The surface roughness of Group 3 is due the organic and inorganic tissue dissolution of 5% ClO2 used alone, overcoming the EDTA associations. Group 4 (13.8% ClO2) showed statistically significant increase in mean surface roughness compared to all the other study groups at P < 0.001. Group 4 had the highest values of roughness, regardless of the association with 17% EDTA. This finding could be related to the high concentration of active chlorine available with the solution (12.69% in 13.8% ClO2) which most likely led to increased degradation of the organic part of the root dentin, resulting in a higher dentin permeability and roughness., Hence, the use of 13.8% ClO2 should be re-evaluated as an irrigating solution, because it significantly resulted in dentin roughness. The concentrations of active chlorine available in the studied irrigation solutions were evaluated by iodometric titration. One of the most important effects with regard to the amount of active chlorine in halogen compounds is related to the pulp tissue dissolution capacity. Chlorine causes saponification reaction with fatty acids and lipids, thus contributing to the tissue dissolution. In this study, it was observed that minimal changes were observed at 3% NaOCl concentration, where the available chlorine value decreased to 2.84%, with 6.4% chlorine loss. In 5% ClO2, the concentrations of active chlorine were significantly lower and had a concentration of active chlorine equal to 3.6% with greater amount chlorine loss (28%). 13.8% ClO2 showed active chlorine of 12.69% with a chlorine loss of 8%. This high concentration of active chlorine available (only 8% chlorine loss) with 13.8% ClO2 solution, which most likely led to increased degradation of the organic part of the root dentin, resulting in a higher dentin permeability, roughness., 3% NaOCl showing 6.4% chlorine loss also showed increase dentin permeability when used with EDTA. This may have led to greater sequestration of calcium ions, thus increasing the surface demineralization. A positive outcome of altering the permeability and roughness of root canal dentin is extended area of dentin surface (the tubules become patent) available for the adhesion of endodontic sealers., However, excessive expansion of this area could be followed by the formation of voids, which interfere with the spreading of material on the dentin surface, thus compromising the adhesion. There has also been some concern about the erosive effects of irrigants that could increase the micro leakage and penetration of bacteria and. Based on the findings of the present study, it may be concluded that 5% ClO2 modified the root canal dentin roughness similar to 3% NaOCl when used with EDTA combinations. 5% ClO2 produced root canal dentin roughness when used alone, but no statistically significant difference with saline group. Hence, it can be considered as an advantage as it produces surface irregularities with minimal erosiveness. Nearly 13.8% ClO2 should be re-evaluated as an irrigating solution because it significantly causes dentin roughness and thus it can promote microleakage. Further studies, should investigate the effect of variable parameters of 5% ClO2 such as volume, various exposure times, favorable pH and stability, effects on different endodontic sealers and to obtain optimum salient properties of ClO2 for its routine use in endodontic practice. Peters OA, Laib A, Göhring TN, Barbakow F. Changes in root canal geometry after preparation assessed by high-resolution computed tomography. J Endod 2001;27:1-6. Gulabivala K, Patel B, Evans G, Ng YL. Effects of mechanical and chemical procedures on root canal surfaces. Endod Topics 2005;10:103-22. Stojicic S, Shen Y, Qian W, Johnson B, Haapasalo M. Antibacterial and smear layer removal ability of a novel irrigant, QMiX. Int Endod J 2012;45:363-71. Baumgartner JC, Mader CL. A scanning electron microscopic evaluation of four root canal irrigation regimens. J Endod 1987;13:147-57. Hu X, Ling J, Gao Y. Effects of irrigation solutions on dentin wettability and roughness. J Endod 2010;36:1064-7. Marending M, Luder HU, Brunner TJ, Knecht S, Stark WJ, Zehnder M, et al. Effect of sodium hypochlorite on human root dentine – Mechanical, chemical and structural evaluation. Int Endod J 2007;40:786-93. Rotstein I, Dankner E, Goldman A, Heling I, Stabholz A, Zalkind M, et al. Histochemical analysis of dental hard tissues following bleaching. J Endod 1996;22:23-5. Eddy RS, Joyce AP, Roberts S, Buxton TB, Liewehr F. An in vitro evaluation of the antibacterial efficacy of chlorine dioxide on E. faecalis in bovine incisors. J Endod 2005;31:672-5. Cobankara FK, Ozkan HB, Terlemez A. Comparison of organic tissue dissolution capacities of sodium hypochlorite and chlorine dioxide. J Endod 2010;36:272-4. Singh S, Sinha R, Kar SK, Ather A, Limaye SN. Effect of chlorine dioxide and sodium hypochlorite on the dissolution of human pulp tissue – An in vitro study. Med J Armed Forces India 2012;68:356-9. Singh S, Arora V, Majithia I, Dhiman RK, Kumar D, Ather A, et al. Comparative evaluation of 15% ethylenediamine tetra-acetic acid plus cetavlon and 5% chlorine dioxide in removal of smear layer: A scanning electron microscope study. Contemp Clin Dent 2013;4:67-70. Herczegh A, Ghidan A, Friedreich D, Gyurkovics M, Bendő Z, Lohinai Z, et al. Effectiveness of a high purity chlorine dioxide solution in eliminating intracanal Enterococcus faecalis biofilm. Acta Microbiol Immunol Hung 2013;60:63-75. Poulos PP. A constant-change (single injection) method for the estimation of the volume of distribution of substances in body fluid compartments. J Clin Invest 1956;35:921-33. Neelakantan P, Subbarao C, Subbarao CV, De-Deus G, Zehnder M. The impact of root dentine conditioning on sealing ability and push-out bond strength of an epoxy resin root canal sealer. Int Endod J 2011;44:491-8. 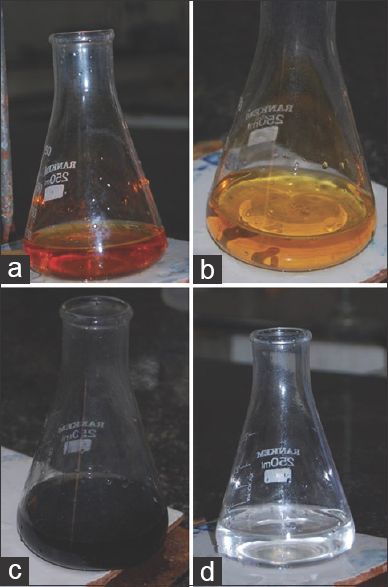 Ballal NV, Khandewal D, Karthikeyan S, Somayaji K, Foschi F. Evaluation of chlorine dioxide irrigation solution on the microhardness and surface roughness of root canal dentin. Eur J Prosthodont Restor Dent 2015;23:P135-40. Doğan H, Qalt S. Effects of chelating agents and sodium hypochlorite on mineral content of root dentin. J Endod 2001;27:578-80. Chandra SS, Shankar P, Indira R. Depth of penetration of four resin sealers into radicular dentinal tubules: A confocal microscopic study. J Endod 2012;38:1412-6. Zhang K, Tay FR, Kim YK, Mitchell JK, Kim JR. Carrilho M, et al. The effect of initial irrigation with two different sodium hypochlorite concentrations on the erosion of instrumented radicular dentin. Dent Mater 2010;26:514-23. Yilmaz Z, Basbag B, Buzoglu HD, Gümüsderelioglu M. Effect of low-surface-tension EDTA solutions on the wettability of root canal dentin. Oral Surg Oral Med Oral Pathol Oral Radiol Endod 2011;111:109-14. Ring KC, Murray PE, Namerow KN, Kuttler S, Garcia-Godoy F. The comparison of the effect of endodontic irrigation on cell adherence to root canal dentin. J Endod 2008;34:1474-9. Estrela C, Estrela CR, Barbin EL, Spanó JC, Marchesan MA, Pécora JD, et al. Mechanism of action of sodium hypochlorite. Braz Dent J 2002;13:113-7. Vilanova WV, Carvalho-Junior JR. Alfredo E, Sousa-Neto MD, Silva-Sousa YT. Effect of intracanal irrigants on the bond strength of epoxy resin-based and methacrylate resin-based sealers to root canal walls. Int Endod J 2012;45:42-8. Aranda-Garcia AJ, Kuga MC, Chavéz-Andrade GM, Kalatzis-Sousa NG, Hungaro Duarte MA, Faria G, et al. Effect of final irrigation protocols on microhardness and erosion of root canal dentin. Microsc Res Tech 2013;76:1079-83.